Perhaps you have already suffered your first frost-coated windshield, forcing you to search for your scraper. As you shiver in the driver’s seat, carefully peering through the freshly-scraped windshield, you realize this is just the beginning of winter and there is worse to come. It’s not a happy thought if you are not a fan of the snow and cold. After all, being this is just the beginning of December, you can expect three or four more months of a frosted or snow-covered windshield when you go to work in the mornings. We are assuming that you are somewhat prepared for winter driving, you have a scraper at least. But you want to be prepared for the worst, so don’t postpone your winter car maintenance. 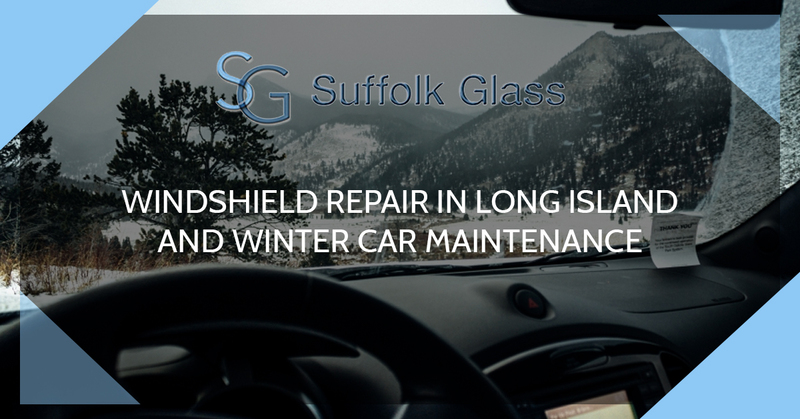 Suffolk Glass, your windshield repair service in Long Island, offers winter car maintenance tips. All-season tires have been on the market for many years. Coupled with the prevalence of front-wheel drive, many folks have avoided buying winter tires. This might be a mistake. Just as cars have improved thanks to technology, so have winter tires. Modern winter tires are quieter on dry roads and very effective in snow. They might be worth the cost and effort to have them mounted. If you aren’t worried about that small crack on your windshield, you should be. You bet your bottom dollar that it will expand in the winter. You will be better off having it looked at and repaired. With the snow, rain and fog of winter, your visibility is already threatened, don’t make things worse with old wiper blades that barely do their job. A new set of wiper blades will enable you to see things more clearly, literally. Cold temperatures greatly reduce your battery’s cranking power. In fact, at 0 degrees, your battery has just half the cranking power it did when it was 80 degrees. It makes perfect sense to take your car to your mechanic to have the battery tested. You can also get it tested at most auto parts stores. If your battery is more than five years old, have it replaced. You need to make sure you have plenty of antifreeze in your car, it might need to be flushed and filled. Not only do you need to ensure your windshield washer reservoir is full, but you should also have a gallon stashed in your trunk for those long and messy drives. Allowing your gas tank to fall under half can cause condensation in cold temperatures. This can cause your gas line to freeze up and effectively block the flow of fuel to the engine. In the winter, days are much shorter, which means you will be driving more in the dark. You will want to make sure that all of your exterior lights are in good shape. Take the time to check your lights and swap out any that are burned out or weak. But first, call Suffolk Glass and get that windshield repaired.